Source: Cash money purchase, yo. In a sentence or so: Samantha Reed is sucked into the Garrett family she's been watching over the fence for years. They're messy, busy, loud...and loving, supportive, unique, and exactly the type of family Samantha needs since her sister is gone for the summer and her mom is busy campaigning with a sleazeball. The bloggers I know absolutely love this book. So of course I was terrified to read it. Could it possibly live up to the hype of being the best contemporary in the history of ever? (I exaggerate...kinda). Would I adore it like everyone else or would I let the hype monster get the best of me and hate it on principle? Turns out, I loved it! The writing style and setting reminded me very much of Jennifer Echols, whom I adore, but was unique and set itself apart to keep things fresh and interesting. Samantha is right on the edge of being two dimensional, but the rest of the characters are so vibrant and complex and authentic that Sam's vanilla personality didn't bother me all that much. She'd crack wise here and there, but otherwise she was a pretty girl who wanted something more out of life. 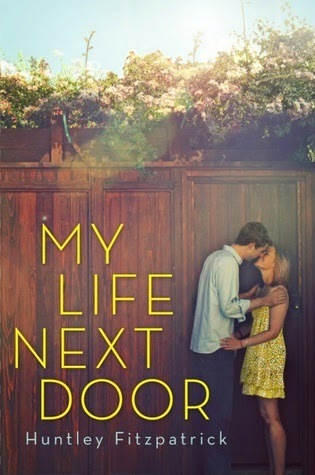 MY LIFE NEXT DOOR is a sweet summery read with a nice balance of fun characters, coming-of age, and lots of exploring relationships (with hot boys and with morally questionable parents and friends). Prepare yourself to fall head over heels for Jase Garrett though. For real. Assuming I am not the last person on the planet to read this yet - seriously, there must be at least 3 or 4 of you out there, right? - be sure to pick up MY LIFE NEXT DOOR! It's a longer contemporary read which means you can stay wrapped up in the glorious world of characters Huntley has created even longer! Wee! You already know how much I loved this book. Since you mentioned Samantha's character being a bit vanilla, I think you might like Huntley's latest book What I Thought Was True, because that MC is very complex! She really held the story, in my opinion. I loved My Life Next Door! It was easy to fall for the Garrett family, first of all. And obviously, Sam and Jase had such a sweet, sweet romance. I'm thrilled you enjoyed it! OH JASE GARRETT. I agree on Sam being a little vanilla for the most part, but that incredible family next door totally made up for it. One of my favorite literary families!